Shuffleboard is Back. Great Family Fun. Tables Starting at $1,199 - More Models & Finishes Available - Special Orders Welcome! 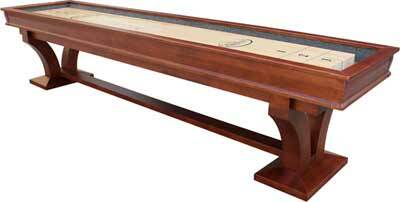 The Penelope 12-foot Shuffleboard Table will provide years of fun and enjoyment for the entire family. The table is made of solid Aspen in a Walnut finish and has 6 storage drawers. Solid Aspen wood playfield measures 128"L x 16"W x 2" Thick including a 1/8" Polymar coating. 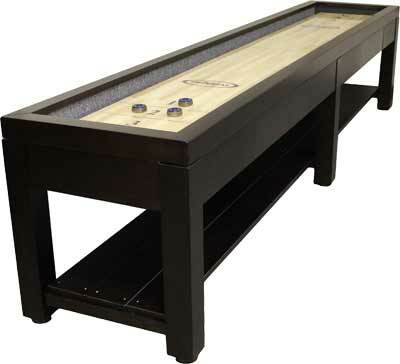 This shuffleboard table is a great complement to the Penelope Pool Tables and will complete your game room. Includes matching dining top for when you are entertaining. Accessories included: 8 pucks (2 colors), table brush, can of Speed Wax, and 2 scoring units. Assembled dimensions: 146-3/4"L x 34-3/4"W x 32-3/4" H; weighs 235 pounds. 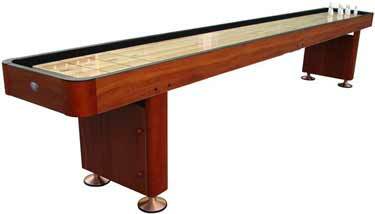 The Brazos River shuffleboards are part of the Fairfield Collection of game tables by Playcraft. The Brazos' trestle leg design and hand finishing is inspired by old world styling and craftsmanship. Whether your choice is a timeless Chestnut or Espresso finish, or a distressed weathered Black, Barn, or Brown that appears to have been reclaimed from a century old countryside barn, the Brazos is certain to make a statement. More than just beautiful furniture, the high quality materials and construction will ensure many years of high quality shuffleboard with family and friends. 12' has two legs. 14' and 16' have three legs. Also available in matching 8' slate pool tables. 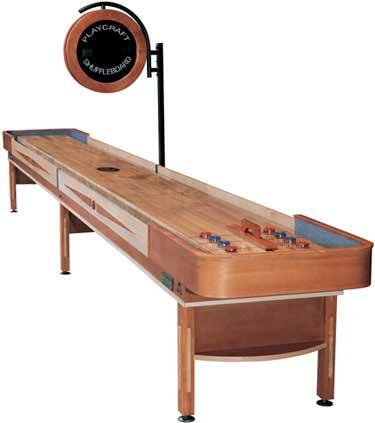 The Columbia River shuffleboards are part of the Fairfield Collection of game tables by Playcraft. The Columbia's reverse arch legs with chamfered base and hand finishing is inspired by classic architectural design and craftsmanship. Whether your choice is a timeless Chestnut or rich Espresso finish the Columbia will be an impressive addition to your game room. 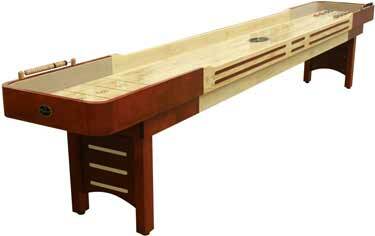 More than just beautiful furniture, the high quality materials and construction will ensure many years of high quality shuffleboard with family and friends. Also available in matching 8' slate pool tables. 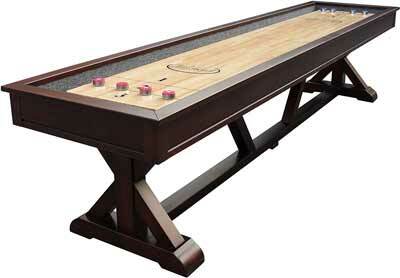 Lowest Prices Guaranteed on ALL Game Tables!